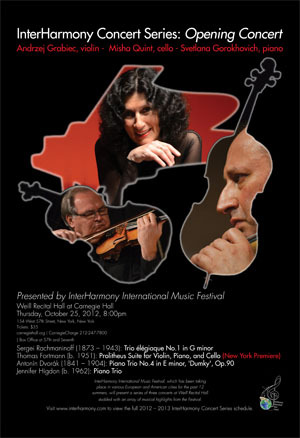 InterHarmony International Music Festival, which has been taking place in various European and American cities for the past 12 summers, will present a series of three concerts at Weill Recital Hall studded with an array of musical highlights from the Festival. The first performance takes place October 25, with additional concerts taking place January 25 and March 21, 2013. 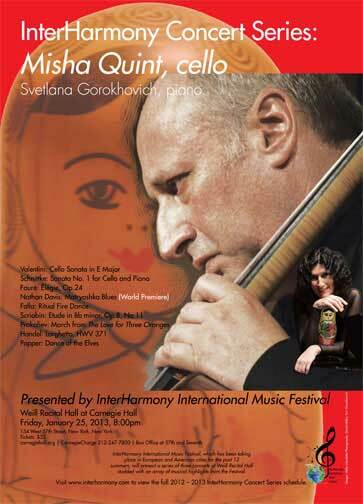 Curated by InterHarmony Founder and Music Director, award-winning cellist Misha Quint, the performance features Quint, violinist Andrzej Grabiec and pianist Svetlana Gorokhovich. The October 25 program includes two contemporary works: Jennifer Higdon's Piano Trio (2003) and the New York premiere of Thomas Fortmann's Prolitheus Suite for Violin, Piano and Cello (2010), as well as Sergei Rachmaninoff's Trio élégiaque No. 1 in G minor for Violin, Cello and Piano (1892) and Antonín Dvořák's beloved Piano trio No. 4 in E minor, "Dumky," Op. 90 (1891). 2010 Pulitzer Prize-winner Jennifer Higdon, whose reputation has been rising with leaps and bounds since she began composing at 21, has always been fascinated by the connection between painting and music. "Can music reflect colors and can colors be reflected in music?" is a question she asks herself. For Higdon, melodies, harmonies and the instruments themselves are the composer's paint and canvas. 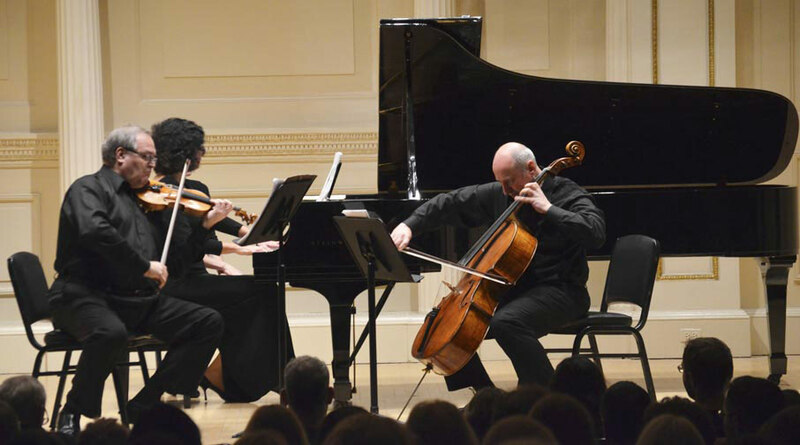 Piano Trio, originally commissioned by the Vail Valley Music Festival, embodies this fascination. The Prelude from Johann Sebastian Bach's "Unaccompanied Cello Suite, No. 3 in C Major" will be played by 14-year-old Hastings-on-Hudson native, Luming Chan. 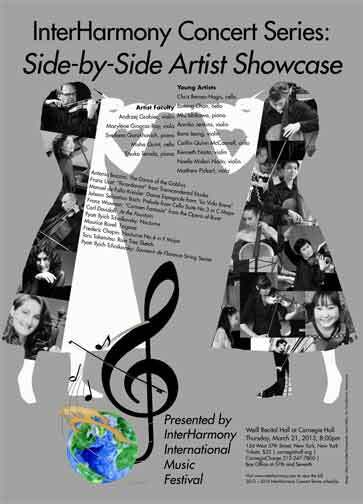 Virginia native, 17-year-old violinist Ànnika Jenkins will play Franz Waxman's "Carmen Fantasie" and 26-year-old violinist Bora Jeong will perform Maurice Ravel's "Tzigane." Swiss-born and now living in Italy, Thomas Fortmann began his musical career as a song writer, writing his first "hit" at 16 followed by over 100 titles released in more than 27 countries and sung by rock stars throughout Europe. Abandoning his pop music career at 26 to commit himself to "serious" studies in composition and instrumentation, Fortmann went on to receive fellowships and commissions from major European houses as well as from the University of Houston in the United States. His Prolitheus Suite for Violin, Piano and Cello, written as an unlikely suite of contrasting musical forms, incorporates twelve tone composition (1st movement); Scriabin's mystic chord that the composer used in his Prometheus (2nd movement); blues to commemorate the section having been written as a tribute to the American South (3rd movement); a play with 12 tones (4th movement); inspiration from the vaudeville song "From Heaven Comes Hell" (5th movement) and finally, the finale or 6th movement. Reflecting his attitude toward music and most likely his own rigorously constructed compositions, Fortmann says: "Music that is purely mathematical is non-sensual. But music without mathematics is nonsense." Written when Rachmaninoff was only 19 years old and still a student, Trio élégiaque, unlike most piano trios, has only one movement, which was created in the classical form of a sonata. Dvořák's much-celebrated Piano Trio No. 4, whose six sections range from gloomy to light-hearted, has been considered a benchmark in the composer's career. Violinist ANDRZEJ GRABIEC, prizewinner at the Fifth International Henryk Wieniawski Violin Competition in Poland (1967) and the International Jacques Thibaud Violin Competition in Paris, France (1969), made his debut with Opole Philharmonic Orchestra in Poland at age 14. He studied at the Szymanowski Academy of Music in Katowice, Poland, where he was later appointed Professor of Violin. He went on to become a soloist and concertmaster of the Great Symphony Orchestra of the Polish National Radio and Television and the leader of Capella per Musica da Camera. 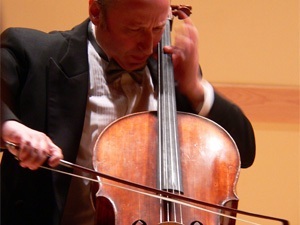 Grabiec became concertmaster at the Rochester Philhamonic, the Wichita Symphony Orchestra in Kansas, as well as Music Director of the Mozart Festival Chamber Orchestra. Grabiec became Professor of Violin at the Moores School of Music at the University of Houston in 1995. He performed with the Houston Symphony in 1999, and is a founder and Artistic Co-Director of the Virtuosi of Houston. Invited by Australia's government, Grabiec served as Artistic Director of an Olympic Arts Tour throughout Australia, New Zealand, and the South Pacific Islands, where he also performed as a violin soloist and conductor in 1999. In 2002 Grabiec performed the world premiere of Concerto for Violin and Orchestra, "Seren", by American composer Peter Lieuwen, and was its dedicee. Grabiec made his Chinese debut in 2008 in Guangzhou, China with master classes and a performance of Saint-Saens Violin Concerto with the Xinghai Conservatory Symphony Orchestra. He has performed under conductors such as Pierre Boulez, Erich Leinsdorf, Krzysztof Penderecki, Witold Lutoslawski, Kazimierz Kord, Mark Elder, and Erich Bergel and continues to teach and perform at a litany of music festivals around the world. SVETLANA GOROKHOVICH has performed in international music festivals in Holland, Germany, Italy and New York. She has worked with Misha Quint since 2005. Her latest performances include recitals in Zankel Hall, Weill Recital Hall and Ridotto Music Series. Gorokhovich received her music training in the Kazan State Conservatory and her Ph.D. from St. Petersburg State Conservatory, studying with distinguished professor Tatiana Kravchenko. She immigrated to the U.S. in 1989. Gorokhovich was the 1997 winner of the Bartok-Kabalevsky- Prokofiev International Piano Competition at Radford University and the 1999 IBLA international competition in Italy. Her solo recital at Carnegie Hall in 2000 was highly acclaimed by the New York Concert Review. Her most recent recording, "One Piano Four Hands," was released in 2012 by SMH Records. She toured world-wide with violinist Dmitri Berlinsky from 1991 –1996. Their recording, "Souvenir D'un Lieu Cher" (Helicon), released in 1997, received enthusiastic reviews. Gorokhovich is on the piano faculty of the Music Conservatory of Westchester in White Plains, New York. Encores, Schnittke, Jazz, and Matryoshkas.